Does the Forever Stamp Make Cents? Home » Frugal Living » Does the Forever Stamp Make Cents? The United States Postal Service announced that they may issue a "forever stamp" - that is, a stamp that you can buy now, at a given price, that will be good into eternity. Like all hedging, this sounded like a good idea at the time, but fortunately, there are people much smarter than me out there to crunch the numbers. I tend buy stamps in bulk and then get seriously irritated when the rates go up a couple of years later and I'm forced to buy all those one and two-cent stamps to supplement my original purchases. So, on the surface, the forever stamp sounds like a good deal - spend $0.41 per stamp today for hundreds of stamps, and those stamps will be good for as long as they can still stick to an envelope! You can use and inflation calculator to determine the buying power of a any money from past to present here. Does anyone even buy stamps anymore? I try to do all of my bill paying online, since the last time I paid my mortgage with an actual paper check, the bank had no idea what to do with it, and called me, asking why I hadn't paid my mortgage like I always did. Random, slightly pointless, and obscenity-filled rant about cent-stealing stamp machine at the post office, anyone? it would have been nice if you went into a little more detail about why the stamp wasnt a good idea. i understand that inflation and all that good stuff will go up...i mean heck a US dollar is really only worth abou 4 cents now. but a stamp is a stamp. you use one first class stamp regardless of whether postage is 29 cents or 89 cents. augh. i can see the far fetched other side of the argument, but they need to consider purchasing power as well..
And I promise you, if I had the skills necessary to delve into the topic more, I would. But I don't, so instead, I link to people who have delved into it. I don't truly understand the way inflation works in relation to the stamps, but it appears that the verdict is that stamp prices match inflation, so it's not worth hoarding them, unless you plan to buy a bunch and sell them after the next price hike. And even then, it seems like you are better served by simply investing your money in a high-yield money market account, anyway. 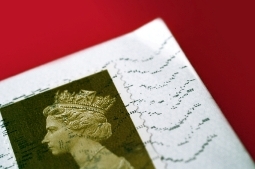 Why not just buy a HUGE roll of first class stamps? Those are the ones they put out in the interim while they hike the prices- the first class stamp will always be the price of... a first class stamp! Does the USPS see the writing on the wall, and is the Forever Stamp a brilliant PR move on their part to stave off the public outcry when the cost of mailing a first-class letter may begin to rapidly outpace inflation? We will always have a need for first-class mail; you just can’t text a condolence letter. However, the cost of mailing this letter may begin to reflect the true cost of its voyage from your desktop to a mailbox thousands of miles away. Just an FYI for the Wise Breaders out there. It's real easy...whatever you spend NOW on forever stamps is money that no longer earns interest. Therefore, to buy or not becomes a matter of time and use. If you could have made more money in a year by not investing in the forever stamp, then you don't buy them. If, on the other hand, you use a lot of stamps and the price rises by .01 cents, then, how much have you saved vs how much would you have made in money market? At current rates of around 2.8% (annualized), if you use 100 stamps, the cost is 41 dollars. Ok, if the price goes up .01 cent, the cost would be 42 dollars...you saved 1 buck. If you don't buy the stamps, in a year, $41 at the rate above would yield $1.15 in interest. So, you lost .15 cents per 100 stamps annaully (keeping a price increase on an annual basis). It's the time value of money...the USPS gets your money and you can't use it anymore once they have it. The cost associated with that is called "opportunity cost." Truth is, none of this really matters unless you use 1,000's and 1,000's of stamps...and if that's the case, you already have a meter.